Sinuous shapes in polymer are lovely but for those of us who weren’t paying attention in geometry class, these smooth curves look impossible. How in the world would you make those cuts? Luckily Helen Breil’s new e-book comes to the rescue. It’s 180 pages of step-by-step instructions and clear explanations of cuts and twists you probably haven’t even considered. The book’s gallery is full of real-life examples from artists you’ll recognize (you may have run into them here on PCDaily). This beautiful spiral version is from Ron Lehocky. Don’t take my word for it, download the free 25-page sample. Why fight your way back through geometry class when you can simply follow what Helen has so brilliantly figured out? Here’s the free link. Buy the $20 book here. I just gave myself a Christmas present and purchased this book. Can’t wait to play with the clay! OMG! This book just got added to my Christmas wishlist! and, just in case, to my birthday list as well! The projects shown in the sample pages are just gorgeous, and I can’t wait to read the whole thing. I just bought Helen Breil’s book and it is AMAZING! She generously shared her polymer clay secrets and I too, can’t wait to try out some new techniques. Thanks for posting this article today! I purchased Helen’s book (an incredible bargain at only $20). It is a fantastic, step by step guide to taking polymer clay to new heights. You will look at this medium differently, I guarantee it! A wonderful, comprehensive book. I too can’t wait to experiment, using Helen’s techniques. early Christmas present, or belated birthday gift? Either way, I look forward to having the time to play. I’ve long been a fan of Helen’s textures, and I can’t imagine that I won’t be equally fond of the book. same here. i love her Radiating Designs Tutorial and will now head over to buy the ebook!! Helen is consistently amazing—her elegant shapes and forms just make us all catch our breath.So happy to be able to glimpse inside that incredible mind. Having taken two workshops from Helen in person I knew we were all in for a treat when this artist offered her first book. 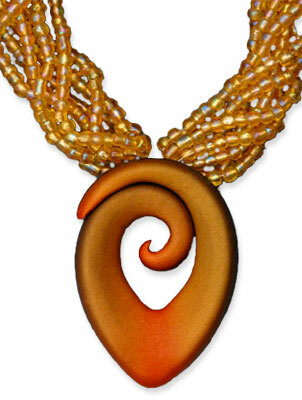 Helen is not only a super-talent in her polymer art but she is a fabulous, generous teacher – this shines through in her e-book where she tells us how she makes these gorgeous shaped pendants. Thank you Helen! This looks like a beautiful book…congratulations Helen! This is a Christmas preset to myself this year. As soon as I received Polymer Clay Daily’s newsletter today I jumped to order Helen’s book and the four basic cookie cutter shapes too. I’m so inspired to learn these techniques 🙂 Thanks so much for sharing! Brenda I love Kumihimo as well….and pieces like these will look so lovely on the braids! Wow, Wow, Wow!! Helen is rocking the polymer world and artists everywhere are inspired by her outstanding e-book!! Love it Helen – you are so generous and amazing! What an amazing book!! Thanks Helen for being such a huge inspiration to many. I’m overwhelmed by the response to the book! Thanks everyone so much for all your kind and encouraging words. I wanted the book to be different but I couldn’t be sure people would be interested in my ideas and my non-traditional approach and topic – thanks so much for confirming that you are interested and I’m on the right track! Thanks so much Cynthia for spreading the word – as always I am in awe of the reach of this wonderful forum you have created for the polymer community. Helen’s designs are absolutely sumptuous…congrats on her new book and all the well deserved kudo’s! Purchased the E-book tutorial…Wow!! and now to order those special cutters…Merry Christmas to me! !